Chuir Conradh na Gaeilge fáilte roimh na pleananna forfheidhmithe de chuid na Ranna Rialtais leis An Straitéis 20 Bliain don Ghaeilge 2010 – 2030 a chur i bhfeidhm, pleananna a foilsíodh Dé Céadaoin seo caite. Ach cháin an t-eagras an easpa uaillmhéine a léiríodh iontu. Dúirt uachtarán an chonartha, Donnchadh Ó hAodha, go raibh “an-díomá” ar an eagras nár aithin an Rialtas pobal na Gaeilge agus na Gaeltachta “mar gheallsealbhóirí i gcur i bhfeidhm na straitéise”. Ba chóir go gcuirfí “struchtúr riachtanach ardleibhéil ar bun idir na húdaráis agus na heagraíochtaí pobail Gaeilge agus Gaeltachta, áit a dhéanfar moltaí i dtaca leis an nGaeilge agus leis an straitéis sula gcuirtear ar aghaidh chuig na hAirí cuí iad”. Chreid an conradh go raibh easpa spriocanna “dúshlánacha, uaillmhianacha” sna pleananna, mar shampla, ní raibh plean ann a thabharfadh aghaidh ar mhaolú stádas na Gaeilge san Aontas Eorpach faoi 2016. Fágadh ar iarraidh, fosta, a dúirt an conradh, gur chuir lucht na Gaeilge agus na Gaeltachta in éadan athrú stádais d’Oifig an Choimisinéara Teanga, deireadh a chur le deontas Gaeltachta d’ábhar múinteora agus an diúltú ar leasú a ghlacadh ar Acht na Gaeltachta. Dr Micheal O Duibh is chief executive of the representative body for Irish-medium education in Northern Ireland. On this page last week, he sought to position his sector as key to the advancement of shared education here. Dr O Duibh is mistaken. While recent education ministers have looked favourably on the Irish-medium sector and while minority languages were upheld in the Belfast Agreement, the Ulster Unionist Party doesn’t believe that any particular sector should be given undue advantage over another. Unfortunately, that is what the current, flawed ESA (Education) Bill is shamelessly trying to do – and that is why my party will be challenging it. The Ulster Unionist Party believes that pupils and parents should be free to choose schools and subjects and, when it comes to languages, have a range of options which will serve them well for life and work in the global marketplace. French, German, Chinese, Spanish and, indeed, Irish are all useful. If you look at the Department of Education’s figures regarding the strength of Irish-medium education, you will see there are 28 primary schools and one post-primary, along with some 13 Irish-medium units of differing types. Between them, all they have are only 4,600 pupils; that’s 1.3% of the entire Northern Ireland school population of more than 313,000 young people. In spite of their small market-share, we recognise Irish-medium as a valid choice for some parents; however, the real questions are whether they deliver a quality education and whether there is enough demand to make the sector sustainable. On the issue of quality education, figures show that, in 2012/13, 43.5% of pupils who attended the only Irish-medium post-primary school, Colaiste Feirste, achieved five GCSEs, including English and maths at grades A* to C. This is significantly below the overall Northern Ireland average of 60.1% for post-primaries. While I fully acknowledge that there are a range of attainment levels across every sector, unfortunately for Dr O Duibh, the limited evidence available does not demonstrate that Irish-medium schools offer an outstanding education. On the issue of demand, while the Ulster Unionist Party does not universally accept the arbitrary Bain benchmark of 105 pupils supposedly needed to make primary schools sustainable, the minister himself seems wedded to it. Of the 28 Irish-medium primary schools, 17 fall short of minimum enrolment numbers. How, then, can he possibly justify opening new Irish-medium schools, often in large urban areas, when there is insufficient local demand? The chief executive of Comhairle na Gaelscolaiochta quoted an interesting statistic: he indicated that, because 72% of Irish-medium schools are within the “other maintained sector”, they were somehow more integrated. The fact is, of the 29 Irish-medium schools, 21 have no Protestant pupils, and the remaining eight all have fewer than five. Out of 4,600 pupils, there are no more than 40 Protestants pupils. Hardly a statistic that turns the Irish-medium sector into the flag-carrier of shared education. Shared education must now become a definitive target, rather than a distant aspiration. Micheal O Duibh is mistaken if he seriously expects the rest of us to buy the notion of Irish-medium education leading the vanguard towards a single, shared system. Danny Kinahan MLA is UUP education spokesman and vice-chairman of the Assembly’s education committee. D’fhógair an tAire Stáit don Ghaeltacht, Donnchadh Mac Fhionnlaoich T.D., ar maidin go bhfuil deontas de €4,050 ceadaithe aige mar chabhair do Choiste Naíonra Thuar Mhic Éadaigh, Co. Mhaigh Eo chun dromchla nua a chur ar chlós na scoile agus trealamh nua a cheannach. Agus é ag fógairt an deontais, dúirt an tAire Stáit go raibh áthas air a bheith in ann an deontas seo a chur ar fáil chun an áis thábhachtach seo a fhorbairt. Dúirt sé freisin go bhfuil “ról an- tábhachtach ag an Naíonra seo i gcur chun cinn na Gaeilge sa cheantar”. OVER 100 kids enjoyed a ‘Gaeltacht at Home’ recently as Colaiste Naomh Eoin held their first summer Irish camp in the grounds of Colaiste na hInse in Bettystown. Two two-week courses ran during July catering for a wide range of students aged between 8 up to 18 and both courses were a huge success. Students had formal classes in the morning with sport, activities and arts and crafts in the afternoon. For the younger pupils, it was a chance to have fun with Irish, according to principal Nuala Uí Cheallaigh, while the Leaving Certificate students had the opportunity to hone their oral skills ahead of next year’s exams. ‘For the junior kids it was about the love of the language and developing their vocabulary for day-to-day interaction while the Leaving Cert classes spent time improving their oral skills, which is particularly important now as their oral work counts for 40% of the points. ‘It was all done through Irish with a focus on using Irish through fun so it really was a Gaeltacht at home,’ said Ms Uí Cheallaigh. She said students travelled from as far afield as Annagassan, Malahide and Rush to take part in the courses as well as from Drogheda and East Meath. ‘We had five Ceilís on over the course and I was amazed that all these kids would go home and still come back, even from as far away as Rush, for the Ceilí evey evening at 7.30 p.m.
All the students really enjoyed the course and it really was a huge success, ’ said Ms Uí Cheallaigh, who is from the Dublin Road and had been principal of the Colaiste Naomh Eoin Irish School in Ashbourne before the opening of the Bettystown camp. ‘It was my idea to open it here, I know from living in the area that the demand was there and people would often ring looking for help with Irish for their kids. People really want to improve their Irish and it was amazing to see the difference, particularly in the Leaving Cert students, they absolutely loved it and you could see their confidence growing as each day went on. A Sinn Fein minister has been accused of exploiting his office to pursue party goals rather than policy issues. But Education Minister John O’Dowd rejected the claims from Ulster Unionist leader Mike Nesbitt over cash being spent on public consultations by his department. Mr Nesbitt – who compiled consultation costs across almost all Stormont departments – said Mr O’Dowd had spent twice the amount consulting the public on Irish-medium education compared to improving literacy and numeracy. The Ulster Unionist chief, who also chairs the Stormont committee which monitors First Minister Peter Robinson and Deputy First Minister Martin McGuinness, has called for changes in the way decisions on public consultations are made. Written Assembly answers show the Department of Education spent more than £46,500 on a review of Irish-medium education since 2007 – when devolution returned – compared to just £22,000 on a literacy and numeracy strategy. In 2008, for example, the department spent £46,447 on a formal launch with documents online, a series of public meetings and meetings on request from various groups – compared to £22,827 on a review of the literacy and numeracy strategy which involved Barnardos and the Parent Advice Centre, and £23,418 on the “every school a good school” initiative on special educational needs. Mr Nesbitt argued: “Sinn Fein are certainly following their own agenda in pursuit of the promotion of the Irish language. A ferocious amount of money has been spent, the sums involved are expodential. Mr O’Dowd hit back, however, saying: “Public consultation is an important element, and in many instances, a legal requirement in developing policy and legislation. “Rather than nit-picking over the cost of consultations he should welcome the fact that key stakeholders, elected representatives and indeed his constituents are afforded the opportunity to respond to key changes being proposed for education here. He said since 2010, when the draft Early Years (0-6) Strategy was launched, investment in pre-school services has increased from £73m to £86m. “I would suggest Mr Nesbitt should check his facts in future before commenting,” the minister added. * Department of Agriculture and Rural Development: Eggs and chicks regulations, Lough Neagh level scheme. * Department of Social Development: Shankill Road and Falls Road tree planting schemes, virtual shops at Castlereagh Street, Donegall Road pedestrian island. * Department of Education: Teacher education in climate change, increased contributions to the NI Teachers Pension Scheme. Tá Forbairt Naíonraí Teoranta i gcomhpháirt le Slán Sábháilte Teo. ag eagrú cúrsa garchabhair iomlán trí Ghaeilge. Is cúrsa trí lá é le páirtchreidiúint (5 phointe) FETAC/CDBO Leibhéal 5 (D20188). Tá an cúrsa seo oiriúnach d’fhostaithe naíonra, d’ábhar oidí/do mhúinteoirí gaelscoile/scoileanna Gaeltachta, d’oibrithe in eagrais Ghaeilge, d’oibrithe óige/ógeagrais nó do mhic léinn ar mhian leo bheith ag obair le páistí (amach anseo). Ionad: Conradh na Gaeilge, 6 Sráid Fhearchair, B.Á.C. 2. Is féidir clárú don chúrsa seo ar líne anseo anois. The first-ever animated film in Manx Gaelic is to be a major feature at the Festival Interceltique de Lorient next month. Caarjyn as Fenee (Friends and Heroes – in English) will be shown on Thursday 8 August in the Auditorium du Cercle St Louis at 16:55. The unique Manx translation of the award-winning TV series is the culmination of a 5-year project, only made possible with the help of many local Manx speakers on the island, who became voice-actors for the cartoon characters in the film. 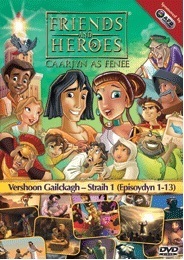 Each episode of Friends and Heroes is set in the first century AD and follows the adventures of two children, Macky and Portia. As they engage in countless escapades and fight for justice across the Roman world, they share the timeless stories of the Bible and learn lessons that help them through many trials and tribulations. Each episode uses a combination of traditional hand‐drawn and stunning computer generated animation to bring the stories to life. Caarjyn as Fenee officially launched last week as part of the annual Yn Chruinnaght festival, held on the Isle of Man. All 13 episodes (over 5 hours) of the First series are available in Manx in a 4-DVD set at just £20. The University of Limerick will host the Tailteann Nua Festival this August Bank Holiday weekend where Irish dancers, musicians, writers, ladies footballers and worldwide visitors will be welcomed for a weekend of Irish culture and fun. The Tailteann Nua Festival takes place from August 2-5 and features a programme of dancing, music, writers workshops and readings, genealogy, storytelling and a Ladies Gaelic Football tournament. Highlights include a Limericks competition where all entrants are invited to come and read their compositions at an event in the Pavilion on campus on Saturday, August 3, from 4pm. Other events include a set dancing and sean nós dancing programme with workshops for all levels and céilís each evening, finishing with the Kilfenora Ceilí Band on Sunday. An international step dancing competition will also take place on Sunday where entrants from all over Europe will compete for the Tailteann Nua Cup in the University Concert Hall. Parnells Ladies Gaelic Football team, along with others, are expected to challenge numerous teams over the weekend in a tournament. A full programme is available at www.limerickgatheringfest.com and all events are open to the public. There are more than 12,000 empty desks in post-primary schools across Northern Ireland – the equivalent of 22 surplus schools catering for 600 pupils each. The Belfast Telegraph has examined figures which lay bare the number of unused school places across various sectors. The statistics – which reveal how many pupils each school is allowed and how many they have – shows that, unsurprisingly, grammar schools are the most popular choice of post-primary education among parents here. Both it and the integrated education sector have no empty desks. The figures have come to light after the publication of annual area profiles – a new health check of every school published online by the five education boards on the instruction of the Education Minister John O’Dowd (right). As well as pupil numbers, they indicate a school’s finances and its academic achievement. The annual area profiles, which come 16 months after the controversial viability audits were made public, will continue to be made available to parents every year. Statistics show unused spaces for pupils in 24 grammar schools, but when you compare that figure against the 43 grammars over quota, there are minus 292 grammar places. The figures were calculated by deducting the approved enrolment from the actual enrolment. Cambridge House Grammar has the highest number of empty desks at 104, but the North Eastern board, through the area planning process, wants to reduce numbers at the Ballymena school to 935 from the current approved enrolment figure of 1,030. Although seven of the 20 integrated post-primary schools are undersubscribed – including Crumlin Integrated with 231 empty desks – 13 are above their approved enrolment, meaning there are in fact minus eight places in integrated provision. The future of Crumlin Integrated is in the balance. Several education boards have proposed increasing numbers at integrated schools including Priory College in Holywood, Erne Integrated in Enniskillen and New-Bridge in Loughbrickland. The other three choices of post-primary education – Catholic maintained, controlled and Irish-medium – all have empty desks. The annual area profiles also show the falling demand for faith-based education with 47 Catholic maintained schools below their approved enrolment, meaning there are almost 7,000 vacant desks in the sector – the equivalent of 12 empty schools. Catholic maintained schools due to close next month include St Gemma’s High in Belfast, which had just 110 pupils, or 320 empty desks, and St Eugene’s in Roslea with 134 pupils (166 empty desks). In the controlled sector are 39 schools sitting with spaces and just over 5,500 empty desks across the sector – or 10 surplus schools. Last month the North Eastern Education Board decided to pursue plans to close Ballee Community College, which has just 227 pupils, or 298 empty desks. The only Irish-medium post-primary school, Colaiste Feirste in Belfast, has 44 empty desks. There are more than 12,000 empty desks in post-primary schools – the equivalent of 22 surplus schools of 600 pupils each. In September 2011 the minister announced plans to rationalise the school estate to reduce the number of empty desks in primary and post-primary schools. The department put the empty desk figure at 85,000 – up from 72,000 in 2009-10. Falling birth rates have led to reduced pupil numbers, but department statistics state that by 2020 there will be a rise in post-primary pupil numbers until 2025. There are plans to close or amalgamate at least 20 of more than 200 post-primary schools here. Tá tionól cruthaitheach á eagrú ag an eagraíocht dheonach Teacht Aniar maidir le hathréimniú na tíre idir Phobal agus Ghaeilge. ‘Athréimniú na Tíre: Ag meabhrú ar Éirinn san 21ú aois idir Phobal agus Theanga’ a bheidh mar theideal ar an tionól seo a bheidh ar siúl sa Bhoireann, i gContae an Chláir ón 5-8 Meán Fómhair 2013. Tá i gceist go dtabharfaidh an Tionól seo deis tuiscintí nua agus féidearthachtaí nua a phlé agus rudaí nua a shamhlú don tír, agus don Ghaeilge san am atá le teacht. Glacfaidh rannpháirtithe ó earnálacha éagsúla i saol na tíre páirt sa tionól seo a reáchtálfar ar feadh trí lá i gceantar na Boirne, an tírdhreach is ársa in Éirinn, chun a dtaithí agus a smaointe a roinnt ar a chéile. Deir Breandán Mac Cormaic, duine de Stiúrthóirí Teacht Aniar, “Is í bunaidhm an Tionóil go mbeadh dearcadh agus cumais éagsúla i láthair ar bhonn measa agus comhionannais. Cé nach féidir a bheith cinnte roimh ré céard iad na torthaí a eascróidh as cruinniú cruthaitheach den saghas seo, gach seans go mbeidh tionscnaimh nua ag teacht ar an saol agus freagracht á glacadh i gcur chun chinn na tíre agus na Gaeilge de bharr na hoibre seo”. Tá an tionól oscailte do chách, ach tá líon na rannpháirtithe srianta do 60 duine agus mar sin is fiú d’áit a chur in áirithe go luath. Reáchtálfar an Tionól go príomha trí mheán na Gaeilge ach tabharfaidh siad siúd a bhfuil Gaeilge acu cabhair dóibh siúd atá ar bheagán Gaeilge nó nach bhfuil aon Ghaeilge acu agus beidh na héascaitheorí ag feidhmiú go dátheangach. Tá tuilleadh eolais faoin tionól ar fáil ag www.teachtaniar.eu, nó is féidir glaoch ar lucht eagraithe an tionóil, Breandán Mac Cormaic, 087 2444 593, nó Martin Hawkes 087 255 4815.